I also checked the COT Index signals on commodities and Silver and Gold is giving quite some false signals lately. Crude oil looks a lot nicer. I guess it is a hard battle for commodities as the USD sometimes shows a lot of strength and then there is some extended weakness as well. To make it easier: no obvious trends. sorry to enter your thread since i do not read it often and actualy never post. i am/was looking for a good short entree on gold the last few months. But right now i am a bit suspicious on shorting gold. It is of course too early to think about a trend reversal but the last 3 COT reports show a increase in open interest on gold alongside the latest reaction from 1125 to 1200, the volume aswell increased quite above the average of the latest downmove. I entered a few short positions the last few days at around 1200-1207. The plan was to keep them open till minimum 1125 (and further) but today, after seeing the latest reports, i reduced the target to 1175-1150.
given the situation that the charts show a potential upmove (at around 1175-1150) i’m considering to start going long in the medium term on gold. Thanks for sharing your view on gold. From a COT perspective, the one strategy I like the most and also like to use is the “1 minute Commodity Trader”. You find a link for the description on the first post of this thread. Based on that, gold is not giving as good signals lately as in many occasions, this is due to the fact that we have a ranging market condition if we look at the last two years. The trend is decided first in that strategy and then we only look to enter the trades in the direction of the trend. Looking at the last trend changes, we had on in the beginning of 2016 when an uptrend formed, and one in the end of 2016 when the first sell signal came. Based on this strategy we are still looking for sell signals. It is a good RRR to trade on this strategy as the SL does not need to be wide compared to the possible TP level. And if a trade is stopped out, then it is an early indicator for a trend change. From a COT perspective we are in a downtrend, but from a technical analysis perspective the lowest low on the weekly wasn´t broken yet. Interesting is the difference between commodities, copper is already in an uptrend based on that strategy. 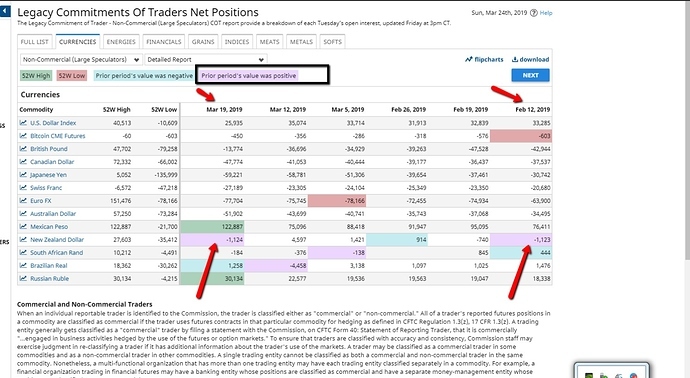 I have a question for you seasoned cot analyst: The school suggests using the “futures only” reports for cot analysis on the forex markets, but wouldn’t the "futures and options combined " report include even more market participants? Or does the synthetic compilation (futures equivalent) of the futures and options combined report makes it… irrelevant? Sorry for the late answer. The question you ask was also once a topic I believe in the thread. In the beginning we used the futures only report, like it was suggested in the BP school. After that, we changed to the “futures and options combined report”. The reason was quite simple: based on the books we read about the COT, they used the combined report so we thought there is no reason not to do the same way like the experts do it. I have to mention though that I did compare the results for some instruments and what I found is that the results were almost the same (at least for those which I observed). I hope this helped, if you have further questions, do not hesitate to ask. Thanks ForExchange (although my response time is shameful), I have another question. I read an article today on the topic of “dark pools” and I see that the SEC is regulating these “non public” exchanges. 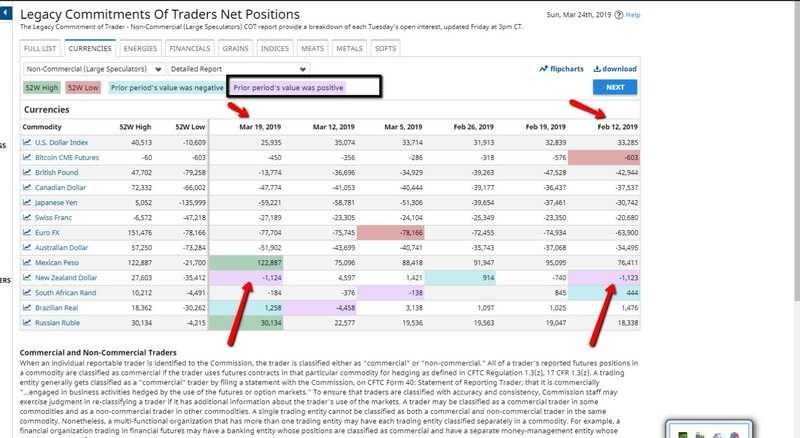 But, are the moves of these institutional traders included in the weekly COT reports? To be included in the weekly report the size of the trade (lets call it the trading volume for the instrument) of the trader/company/institutition has to reach a certain size and you need to use the given exchange. I do not remember exactly what the size of that trading volume was, maybe Peter does. The COT index is not available on TimingCharts.com any alternatives? Sorry, I haven´t seen your post as I do not get emails somehow anymore if there is a post. The new format of the site is not my best friend. I check the site, unfortunately it seems like they offer now just very limited services for free. I also wanted to dig deeply in Gold, but it did not work. I do not know any other site which has such great COT analysis online. Do you? Besides that, Oanda has some information on their website (we used it earlier), but that is just some very basic information. It makes sense what a great buy signal there was in Gold and Silver. Now we are moving back from the COT extreme, must wait patiently until the next signal is going to arrive. Hey ForExchange, So I made my own index using excel (in according with Larry Williams’ instructions as well as BBalazs’ from post #1720) and for a couple of markets the index reading exceeds 100 and even negative numbers too. Is this normal or should I double check the formula inputs? You haven´t really said which indicator you are talking about, but anyway it seems like there is a mistake. I do not know any of the indicators where the number is above or below 100/-100. Let me know if there are further questions. Which indicators do you use, btw? My bad, I’m speaking of the 3 year look-back of the commercials’ net index. I have readings up to 180 on the Yen, and readings as low as -13 on the loonie. I double checked the formula and still can’t seem to find my misstep. Ok, I am not sure then what is wrong. Maybe you can send the excel sheet to me and I can check it. Is it possible to send within BBP mailing? I am not sure if you want to upload to make it public. You decision. I guess we can solve the situation and find the root of the problem. BTW Cot Index shows a buy signal on Silver. Now need confirmation on that one as the setup looks interesting! wisefool, I am not sure if you are here. However if you are, check what a great signal the COT index gave. I posted 16 days ago on silver. Basically it was the absolute bottom! Can you please share your current findings on silver? I also drop you an email as I believe there might be some interesting opportunities coming up again. Awesome mate I will be bookmarking this thread, very well done. Important is to compare it to its historical value, not only if it is positive or negative! Are you updating your database regularly?